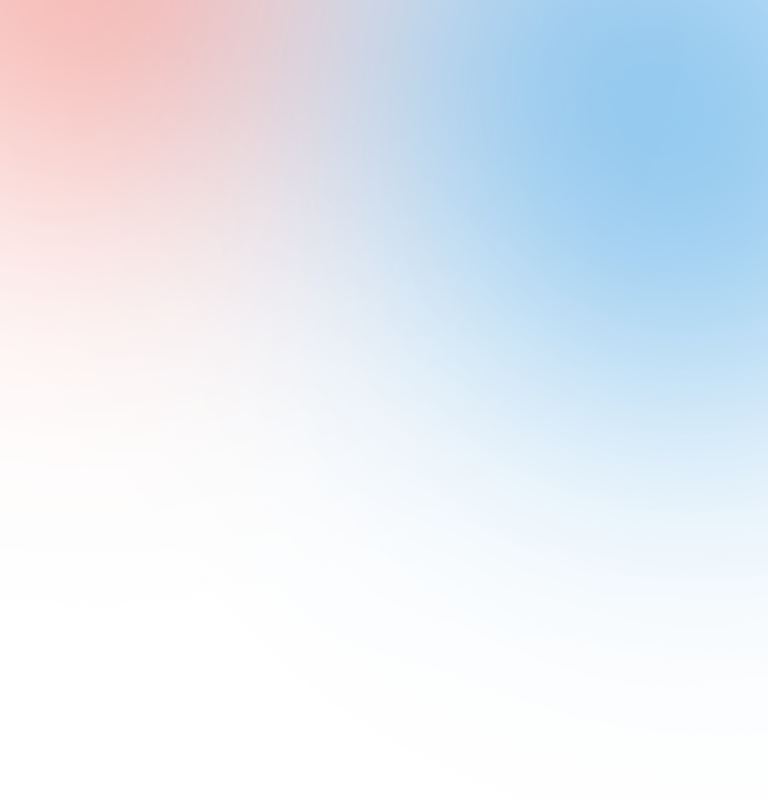 As with many things in life there is a cost of ownership, the same is true for your artwork. 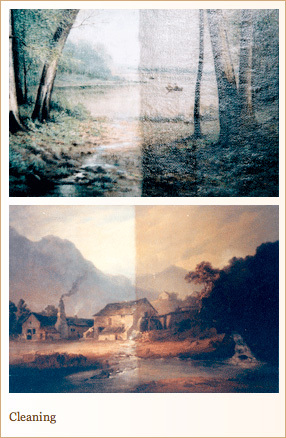 McCaughen & Burr Fine Arts recommends that a painting be cleaned every 20 – 25 years. This process not only enhances the aesthetics of the painting by removing the naturally yellowing varnish, but also serves to preserve the painting for future generations. Cleaning of paintings is but one of the many services that McCaughen & Burr performs in the restoration/conservation field. Whether it is the cleaning of a painting, repairing a canvas that has been torn, or damage due to fire or water, our knowledgeable staff will be able to find the perfect solution for your restoration/conservation needs. No project is too small or too large for us. We have in the past cleaned and restored many of the finest murals in the state of Missouri, including the state capitol. We recognize that not all works of art are national treasures and that often a paintings value is in the eye of the beholder. Regardless, of the value each item that is brought to us will be treated with the utmost care. We have and continue to be the preferred firm for discerning St. Louis collectors as well as institutions both private and public. Please contact McCaughen & Burr for a no charge evaluation of your artwork. We thank you for your trust and your continued support of the gallery. How often should a painting be cleaned? It is recommended that a painting be cleaned every 20 – 25 years. As you have likely seen from either your own painting or visits to your local museum, when paintings age they take on a yellow cast that obscures color and sharpness. Is it worth the cost to restore my piece? Most often yes. Obviously if a painting has considerable monetary value then the answer is yes. 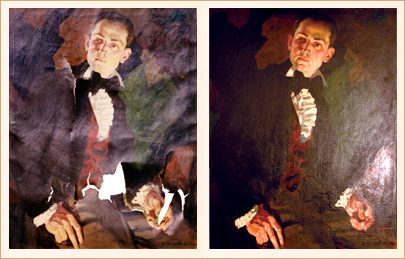 However, we also restore paintings whose value is less than the cost of restoration. These are paintings that have a special meaning to the owner. You cannot put a price on sentimentality. What types of f damage to a painting can you restore? Just about everything. 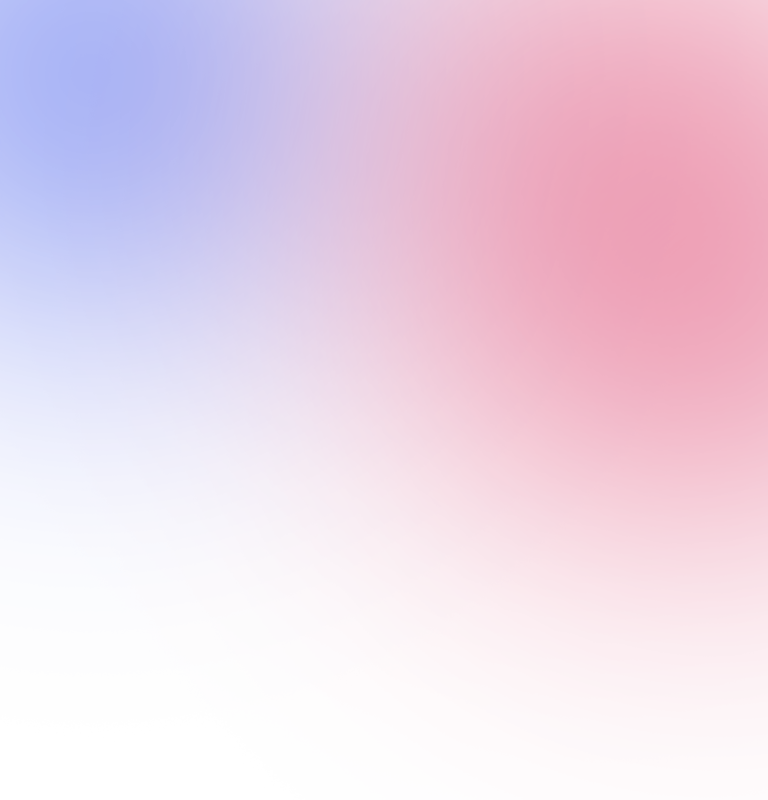 We have had paintings that were torn in half, ones with large holes, ones that have been through a fire or flood, ones missing large areas of pigment, ones that have crazing, canvases that have become wavy due to faulty stretching as well as nearly any other problem you could imagine. Do you restore paper objects? We have been in business for well over 175 years. We have virtually done work for every public and private institution in the mid-west as well as many private collectors. A partial list would include: Washington University, St. Louis University, Mercantile Library, The Old Cathedral, The city of St. Louis and the Missouri Capitol Building. Our work with private collectors includes the most prominent collections in the Midwest as well as those who may have only a single painting that they value. Are you able to restore many pieces at once for a large collection? Yes. We can restore as many as needed within a timely manner. Yes. 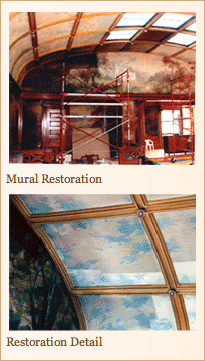 We have restored countless murals throughout the mid-west region. Often we are able to remove the murals and bring them to our restoration studio to be worked on. Other times we do the work on-sight. Each project has to be looked at individually and decisions are made to ensure the integrity of the work. Absolutely. For several years we have been engaged in the business of fire and water restoration. We work closely with all of the major insurance companies and have been able to bring back to life thousands of objects that homeowners thought were lost. Because of our abilities to work closely with insurance companies we are able to offer you advice as to how to navigate your way through this complicated process.